Accessories: Accompanied by Omega Extract from the Archives confirming production on April 11, 1968 and delivery to Hong Kong. Displaying an arresting and beautiful chocolate "tropical" dial, this reference reference ST 145.012-67 SP is distinguished by its excellent condition. The dial boasts an even and rich brown shade. The luminous markers have aged evenly with the hands and display warm patina. The case is preserved in equally impressive condition, and has seen very little intervention throughout its lifetime and displays crisp bevels. The bezel is correct and displays a "Dot Over 90", which is correct for this reference. 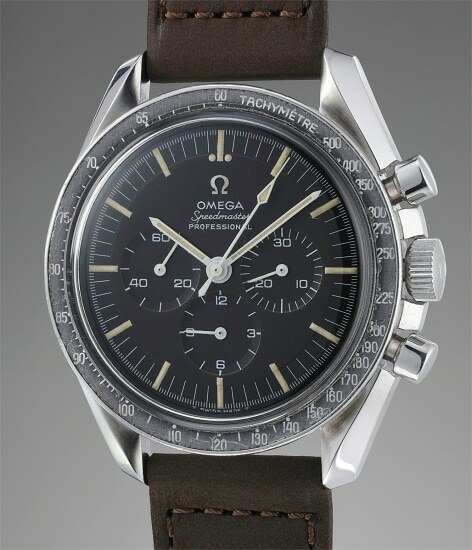 The single bevel case back with "Speedmaster" in the center is also correct. Omega’s Speedmaster reference 145.012-67 was produced in 1967 and 1968 and was one of the wristwatches NASA chose for its Apollo program. This particular model with ‘lyra’ style lugs housed the caliber 321, a favourite amongst collectors and the last model to feature it. Omega upgraded their earlier 105.012 case using a new design that was made for greater water resistance. The pushers were screwed in to the case and the case back was stamped ‘SP’ for ‘special poussoirs. Interestingly, the present watch was delivered on April 11, 1968 for Hong Kong - a city in the tropics. It comes as no surprise that the elements have caused this dial to turn brown over time. Omega's rich history begins with its founder, Louis Brandt, who established the firm in 1848 in La Chaux de Fonds. In 1903, the company changed its name to Omega, becoming the only watch brand in history to have been named after one its own movements. A full-fledged manufacturer of highly accurate, affordable and reliable watches, its sterling reputation enabled them to be chosen as the first watch company to time the Olympic Games beginning in 1932. Its continued focus on precision and reliability ultimately led their Speedmaster chronograph wristwatch to be chosen by NASA in 1965 — the first watch worn on the moon. Key models sought-after by collectors include their first, oversized water-resistant chronograph — the reference 2077, early Speedmaster models such as the CK 2915 and 2998, military-issued versions of the Seamaster and oversized chronometer models such as those fitted with their prestigious caliber 30T2Rg.